You, too, can be a successful predictionist! Publicity, such as headline news and front page stories are the lifeblood of modern show business. Super Prediction Tricks are proven top notch publicity-getters. Properly executed, they are the easily arranged and assured method of getting sensational publicity and news stories - publicity worth thousands of dollars. This ebook of predictions and sensational showmanship has been eagerly accepted and highly praised by the members of the profession. You, too, will cherish it and utilize many of the fine effects. Hail to the man or woman who does the unusual, as they are constantly in the news. To the man or woman who can (apparently) predict future events, and prove it - that person is destined to be the daily topic of conversation, and to be long remembered. John Booth's prediction of the Joe Louis-Billy Conn fight (using Nelson's Prediction Chest and under the direction of Bob Nelson) at the I. B. M. Convention in St. Louis received more publicity than all other acts on the Headliner Show, and was the most talked-about event of the entire convention - and was given nationwide newspaper coverage. Ditto for Bob Nelson's prediction at the I.B.M. Convention at New Orleans. Bob Nelson's "Miracle Prediction of the Age," performed at the Pittsburgh I. B. M. Convention, made front page coast-to-coast and world wide newspaper coverage, was radioed on the networks, publicized in the four corners of the world and proved to be one of the biggest and most sensational magic publicity hits of all times! Publicity that resulted in thousands of dollars worth of fees. What mortal man can predict, with unfailing accuracy, events of the future? Events such as headlines of newspapers days and weeks in advance, the exact number of the stock and bond sales for a given future date, the exact outcome of sporting events, contests, court decisions, elections and the future actions and thoughts of legitimate spectators. 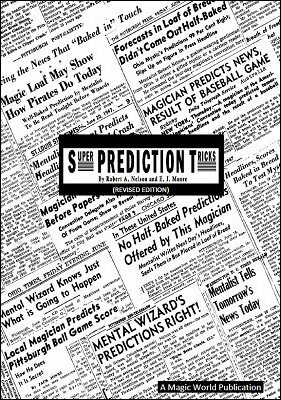 Nelson and Moore give you a vast array of Super Prediction Tricks - 23 in all. Each one explained in detail. You need no expensive apparatus except this information and a few items (possessed by most magicians and mentalists, or available at additional cost) to create headline publicity stories for yourself. Predictions are easy to do - when you know how. The information is detailed, explicit and comprehensive. Plus commentary on showmanship, staging and presentation. It tells how to do the predictions and how to get the publicity, and cash in on it. Partial contents: Coincidence in Numbers, Prediction in Envelope, Fantasy in Numbers, Amaz-U Prediction, Sealed and Locked Prediction, Biddy the Mindreading Chicken, Registered Letter Prediction, Challenge Letter Prediction, Loaf of Bread Prediction, Bottle of Milk Prediction, E. J. Moore's Prediction, Brain Wave Prediction, A Study in Showmanship and many others. Considering the value to the performer, we regard this ebook as one of Nelson's most valuable contributions to the Magic and Mental Professions. "A collection of practical predictions. The authors point out how it is possible to build the feats into tremendous events capable of garnering the type of publicity so dear to the heart of every performer. If you find one method which appeals to you (and you should) and which you can present with the proper showmanship, then this book will be worth the price." - J.G. Thompson, Jr., Review in The Linking Ring . We feel that the "Biddy, the Mindreading Chick" routine by itself is worth several times the cost of the entire ebook. The included lecture and patter will help ensure that it will be a hit with your audience. In case you don't own the necessary prop, a new Appendix now includes a diagram allowing any performer with a well-equipped home workshop to construct his or her own.